It is very easy to think of the Early Mediaeval period as being dark, stark, and grim. An environment where most people lived in dwellings that were a single chamber, with small, unglazed, shuttered windows and a hearthstone in the middle of the floor and the smoke rising to filter out beneath the thatched eaves, does not appeal to our love of creature comforts. In the twelfth century the majority of people in England lived in dwellings that were a single chamber with a central hearth, low eaves, and shuttered openings for windows. Life indoors was not light and airy, but then a lot of the day was spent in the open air, working the land. Even the inhabitants of towns were not enclosed; butchers butchered and tanners tanned in the open air, and craftsmen had large shuttered frontages to their workshop homes, both for light to work and access for customers to see their wares. Nearly all the domestic architecture of the period is long gone, or so transformed as to be unrecognisable, so what we see are castles and ecclesiastical buildings, edifices in stone. Many castles are ruins, most churches have undergone change as they have been enlarged and ‘upgraded’ over the centuries, and nearly all are shades of grey (not fifty thereof) or sandstone pinks and reds. 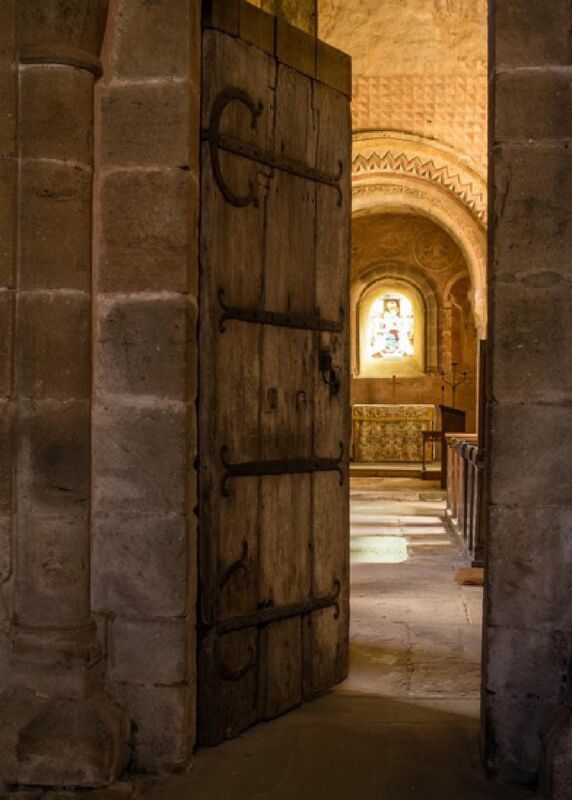 If we enter a church with Norman elements still visible, we are impressed by the carving of arch, the curve of barrel vaulting or massive round piers, and do not usually think beyond shape and scale. It is difficult to imagine that such buildings were also brightly decorated. This world, they announced, might be gloomy, but Heaven was bright, the Church was the link to Heaven and obedience the path to eventually reaching the light. Once walls began to be plastered, it was possible to decorate pictorially, as well as adding colour to the geometric carvings and to those great piers, which were often decorated in chevron form. The colours used were earth based ochres in the main, so shades of reds and terracottas, yellow and mustard/cream. Thus a church, and even more so a cathedral, was unlike the everyday world, but a glimpse towards the world to come. Patterns were eye-catching, but in a largely illiterate world, then paintings educated, informed, and also warned. It therefore became popular to show the congregation not only scenes from scripture, but the perils of sin, and the blessings of virtue. Such depictions became ever more graphic in what would happen to the sinner at the Day of Judgment. (This is where one needs to remember that ‘Doom’ comes from ‘dom’ the Old English for ‘judgment’, hence Domesday book.) These paintings developed through the mediaeval period until the Reformation, and were then destroyed or whitewashed over, to be rediscovered centuries later. We may never know exactly how prevalent they were. Of course they cost money, so churches with wealthy (or perhaps guilt-ridden) patrons would be more likely to possess the best paintings. 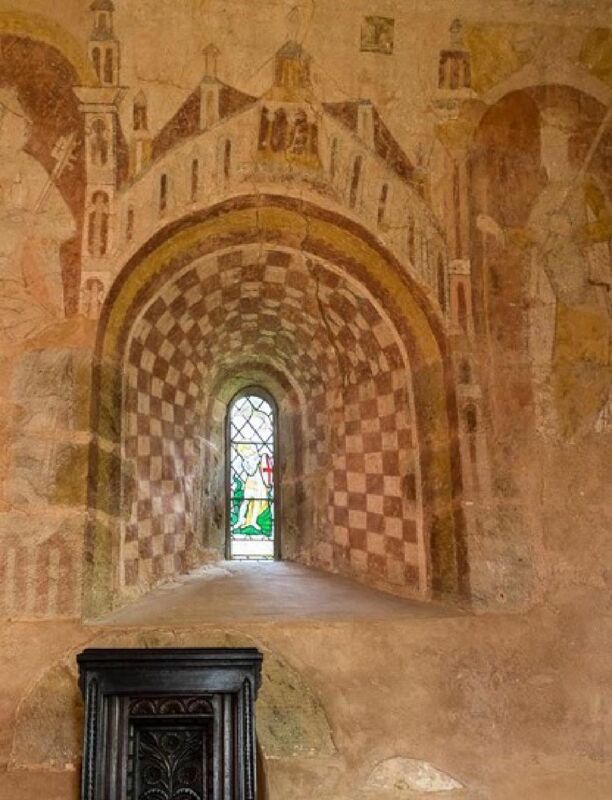 One of the very finest and earliest extant examples of mediaeval wall painting is at the church of St Mary, Kempley, a few miles south of Ledbury. Now redundant, it is cared for by English Heritage, and entrance is free. 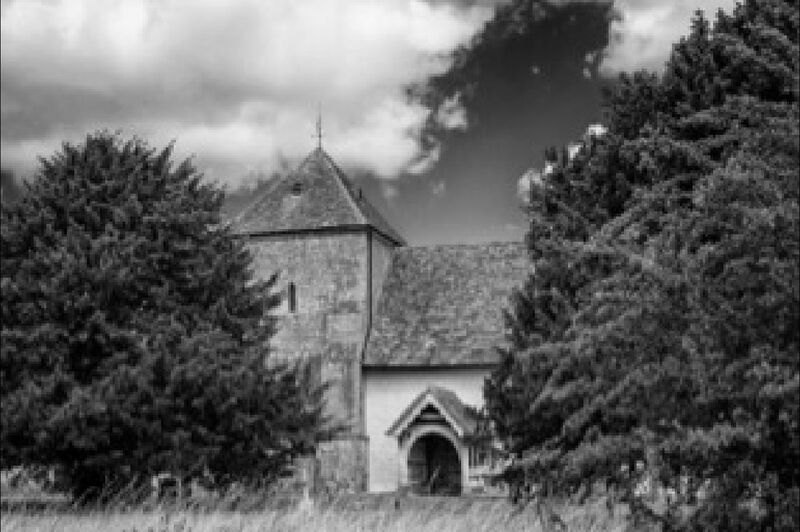 It is in Gloucestershire, but within a few miles of Bradecote & Catchpoll’s own stamping ground, and is predominantly of their period, built about 1120/1130, with a tower added in the thirteenth century. The small west door, now leading into the tower rather than the outside, has been dendrochronologically dated to being of wood felled between 1114 and 1144, and the construction method is such that the experts believe the main south door to be of the same period, so you can actually open a door that Bradecote or Catchpoll might have opened. The nave is still the same simple aisle-less shape, but has undergone more changes than the chancel, with later window additions. This means most of the wall painting in the nave is a little later, with the exception of the chancel wall. However, it is thought that originally the Romanesque wall paintings did continue further in the space where the congregation would stand. 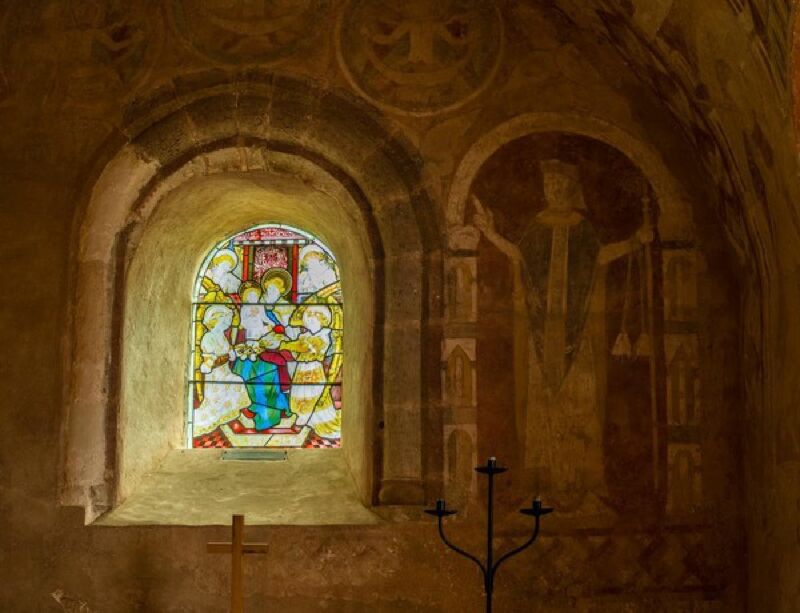 It is when one enters the chancel, which would be the preserve of the priest, and where laity might only glimpse its glories on very special occasions, except through a screen, that the full magnificence of the twelfth century paintings can be seen. The low barrel vault and the walls are all decorated, and their colours, even though probably the base paintings and lacking much of the fine detail, are clear and quite bright. Christ sits in judgment, with the twelve apostles on the walls at either side. There is a depiction of the New Jerusalem above a window, and images of bishops and pilgrims that may well represent the consecration of the church and its benefactor. Unlike later Judgment paintings, the fate of the sinful, being tossed into the Eternal Flames, is absent. When these paintings were fresh, how bright they must have been, and how they must have drawn the eye, and focused the mind also. Even when window embrasures were small, the plastered walls would reflect the candlelight upon the images. The red and yellow ochres are much in evidence but, in addition, Kempley has the earliest use in England of blue azurite in the pigments. This was a very expensive pigment, which shows that a wealthy patron paid for the artwork. The manor belonged to the de Lacys, an important baronial family who originated in Lassy, Normandy, and this shows their wealth and power, as well as religious devotion, (endowing churches and monastic institutions was considered very beneficial for the soul). So I commend this tiny mediaeval gem to any who can go and see it, not only for its history, and indeed its charm, but because within its walls I feel Bradecote and Catchpoll are even more ‘real’, and you can see life was not as drab as you might think.